White noise and nature sounds are specifically tuned to the acoustics of your bedroom to mask disruptive noises. Silence isn’t always golden. If you sleep next to a serial snorer or have a consistent humming in your head, a quiet bedroom can mean a night’s lost sleep. The Nightingale sleep system promises to wrap the slumber-challenged in immersive, soothing sound specifically tuned to mask disruptive noises. And it does so pretty effectively, though the cost of a night of uninterrupted shuteye is pretty dear. The Nightingale Premium Edition system ($249) comes with a pair of sound units, each measuring 4.3-by-2.7-by 1.7 inches. (A single unit version is available for $149.) These plug into any 110-volt outlet. 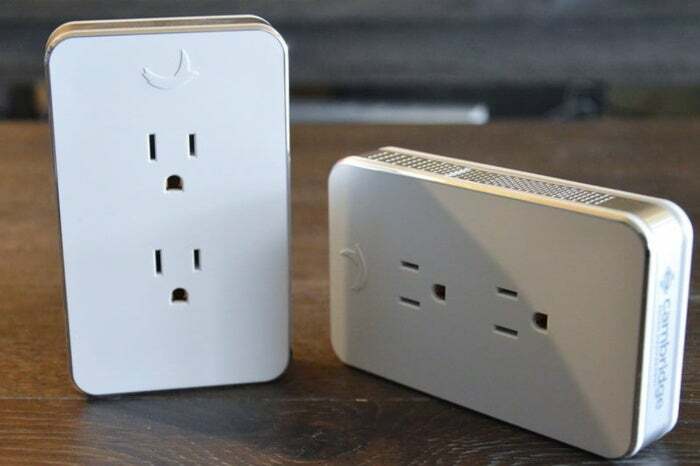 As each unit includes two three-pronged plugs, you can still run your lamps or appliances from that wall receptacle. Together, the two units are designed to cover up to a 300-square-foot bedroom. Nightingale says they’re most effective when you plug them in to opposite-facing walls so they can produce even coverage that blends into the background and can't be localized. The system requires minimal setup. Once the units are plugged in, a voice guide prompts you to download the Nightingale app. The app performs a quick scan for each unit and then offers to connect via Wi-Fi or Bluetooth. Then it runs some questions by you to help it optimize for your unique situation. These include inquiries about whether it’s an adult or youth bedroom and what’s in it as surfaces such as hardwood flooring, carpet, drapes, and glass will all affect sound absorption differently. Lastly, it asks about any medical conditions, such as tinnitus or snoring, and if the room is a hospital room. Nightingale units plug into your wall outlets. When this Q&A process is complete, the app creates an appropriate sound profile, which it calls a “sound blanket.” Mine was accurately named Adult Bedroom Blanket and consisted of the default white noise and whale song. 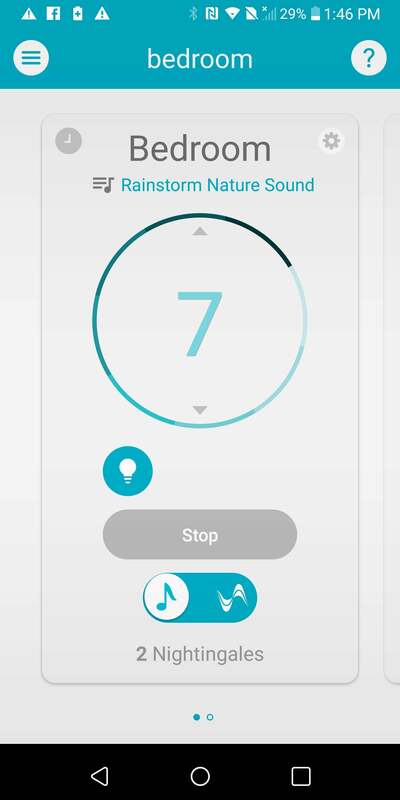 The Nightingale app is essentially your remote control for the two units. There’s a toggle to switch between the sounds, a play/stop button and, volume control that sets the loudness between 0 and 10, and an on/off button for both units’ night lights. 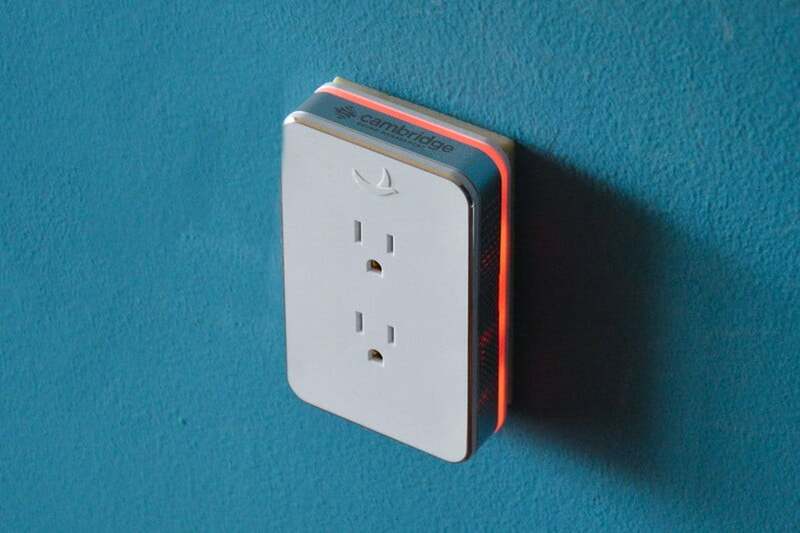 You can schedule the both the sounds and the onboard LED night lights to turn on and off automatically, but even then you can override them manually. I spent the first few nights using the sound-masking white noise setting, which sounds exactly like TV static. With one unit on either side of the bed, it did indeed feel like being wrapped in sound. At a volume level of 7, it did a decent job of covering the sound of my cats’ nocturnal romps, the most common after-hours noise in my place, and at 9 it even masked the suburban street noise and nocturnal critters I can often hear outside our bedroom window. Each Sound Blanket contains ambient sounds you control with the Nightingale app. The nature sounds, which are intended to sooth rather than mask noise, are more of a mixed bag. The mournful whale song did nothing but creep me out in the dark, so I played around with the other options in the app. Lakeshore is a blend of crickets, birds, lapping water, and other forest-type noises that I found quite soothing. Crickets sounded more like a synth patch than a nature recording. Loons was just distracting, and Rainstorm sounded like one of my kids left the water running in the adjacent bathroom--at least until a terrifying clap of thunder would remind me what I was actually hearing. But these are all a matter of personal preference, and chances are at least one will work for most folks. The bigger challenge is finding one to agree on if you share your bedroom with someone else. Nightingale recommends you stick with your assigned sleep blanket for a few weeks before making a judgement. If your sleep isn’t improving, the app can help you construct a new sound blanket or you can just make one on your own. Currently, the Nightingale offers limited smart-home integration. You can pair it with Google Home to turn it on and off and change sounds with voice commands. There are also a handful of IFTTT applets that let you set the night-light color (white, red, green, or blue) or sound with Amazon Alexa and have it alert you when your Nest Thermostat detects the temperature rise above a certain level, among other things. I can’t honestly say that the Nightingale is any better at sound masking than any of the dozens of much cheaper white-noise machines out there, or even the air purifier that had doubled as my white-noise machine for years. Given its price, I’d have to say its appeal is likely limited to smart-home enthusiasts who want a more automated option. If that’s you, it’s worth giving a try. All you have to lose is a bad night’s sleep. If you're a smart-home enthusiast, the Nightingale sleep system is an elegant solution for blocking unwanted noise in your bedroom, but it's not necessarily better than less-expensive white-noise machines.